This in-depth investigation by the Montreal Gazette shines a spotlight on road conditions and the ugly consequences of ignoring maintenance. The article explores the lack of government investment in road maintenance and how it has led to crumbling infrastructure and a network of streets that fail to meet acceptable standards. The piece highlights why a solid maintenance plan is so crucial to the success of a city and how relying on reactive maintenance can create a snowball effect of bad results and heavy spending. A commitment to exceptional maintenance practices can have a huge impact on the environment. That is the gist of this piece, which summarizes the findings out of Rutgers University linking sustainability and infrastructure maintenance. Research shows that keeping road pavement in good shape saves money and energy, and reduces greenhouse gas emissions. This article examines the study, its results and the implications for both the maintenance and the transportation industries. A major factor in the success of any production facility is customer satisfaction. Without the trust of buyers, manufacturing organizations can’t survive, never mind thrive. 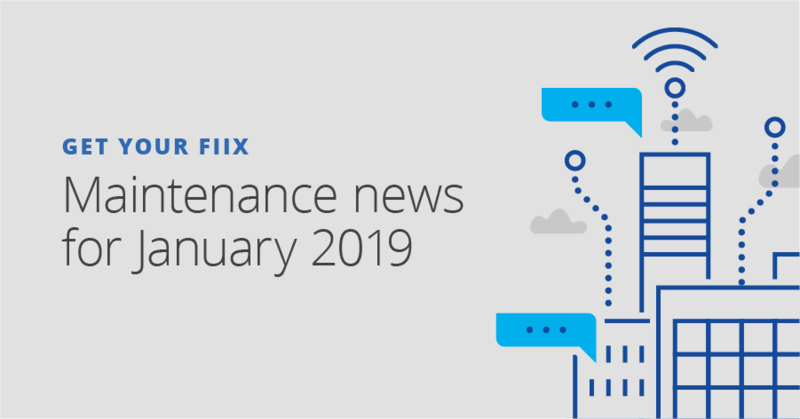 This article explores the connection between maintenance and achieving an exceptional customer experience. The piece examines how predictive technology can help the maintenance team become a key driver in meeting and surpassing customer expectations. It focuses on leveraging technology to increase reliability and overcome the obstacles of today’s shift in customer needs and wants. When it comes to change management, it’s hard to know where to begin. There are many moving parts that need to be considered in order to execute change successfully, especially with CMMS implementation. In fact, the idea of change management is so daunting that some avoid it entirely (not a great idea). Fiix’s Customer Success Team Manager made a trip to the Rooted in Reliability podcast to discuss change management and successful CMMS implementation: What needs to be considered, who should be involved, and getting people on board. Salt and pepper. Batman and Robin. Movies and popcorn. Some things just go together. In the world of asset management, preventive maintenance and planning is one duo that stands out. A preventive maintenance plan can allow your operation to conquer unplanned downtime while avoiding the pitfalls of a reactive approach. This article outlines eight steps for building a successful preventive maintenance plan from start to finish, including how to establish goals, leveraging technology and getting buy-in from the whole maintenance team. Criticality and reliability go hand-in-hand. But how do we actually decide what makes a piece of equipment “critical”? This piece explains how to performing a criticality analysis to understand the potential risks that could impact your business and increase asset reliability through maintenance. It includes a brief description of a criticality analysis, why it’s important, who is responsible for conducting an analysis and how to perform one. By the end of the article, you’ll know how to identify risk and where to allocate your most important resources. A facility’s assets are the lifeblood of the company and its people are the heart. Every member of an organization can make an impact on equipment with the decisions they make. Executives invest, engineers design, managers plan, technicians care for and operators use. That’s why having an asset management policy is crucial. This article charts a course towards building an effective asset management policy, including all the critical elements, a sample template and some handy tips for how to implement a policy of your own.